From a standing position, with the legs together or hip width apart, slowly bend the knees. Stretch the arms up over the top of the head. Clasp the hands together or keep them shoulder width apart. This is a good yoga posture to strengthen the quadriceps and knees. If you have a knee problem be careful. Don’t bend the knees beyond the point of mild discomfort. This is an excellent yoga posture to do in the Sun Salutations especially if you have low back problems. 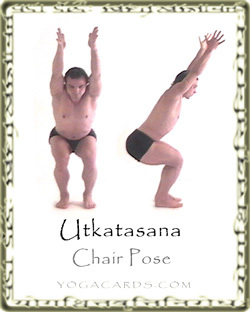 Entering a mild Chair Pose (Less than the on the way up and the way down will greatly relieve pressure and tension around that area. It may mean the difference between your lower back feeling good or the lower back being aggravated. It is hard to stabilize the muscles on the inside and outside of the knees. If you prefer add some distance between the feet. It is easier to evenly distribute the weight over the feet when this is done. The feet can be taken as wide as hip width apart. This pose increases strength, balance and stability. The Hamstrings, quadriceps, gluteals, and the erector muscles of the back are exercised and strengthened. The erector muscles contract isometricly to keep the normal curvature of the spine. The anterior lower leg muscles get toned. These include the tibialis anterior, extensor halluscis longus, extensor digitorum longus, and peroneous tertius. This group of muscle primarily extends the toes and dorsiflexes the ankle and are used for balance and stability. Tadasana (Standing) and almost all the standing yoga postures, Trikonasana Uttanasana Parivrtta Trikonasana Parsvakonasana Revolved Lunge Virabhadrasana 1 Virabhadrasana 2 Urdhva Virabhadrasana Virabhadrasana 3 Ardha Chandrasana Parivrtta Ardha Chandrasana Anjaneyasana Anjaneyasana2 Adho Mukha Svanasana Bhuja Vrischikasana Bakasana and many other standing postures not mentioned. Be careful not to aggravate knee problems. Always allow the student to choose the depth to come to and encourage deeper boundaries with wisdom and grace. Try many different arm positions if it is uncomfortable to have the arms as shown. Offer variations.